When thinking brings pleasure. When thinking brings pleasure? : What Does The Mueller Report Do? What Does The Mueller Report Do? Thinking is a mental process. But not every mental process is thinking. Analytical reasoning involves choosing between different alternatives based on the analysis of various parameters. People often confuse choosing between several alternatives and selecting from several choices. The process of selection does not involve logical reasoning. Here is a simple illustration to demonstrate the difference between choosing from alternatives and selecting from choices. You are at a restaurant selecting you’re dish from a menu. If you just look at the pictures and then point your finger at one of those pictures following your gut feeling - that’s selecting from choices. If you analyze the parameters of each dish, like how much fat does it have, sugar, salt, calories and then make your decision -that’s choosing from alternatives. Selecting from several choices does not require thinking. Choosing from several alternatives does require thinking. Every single opinion about the Mueller report I’ve heard on a radio, on TV, or read on the Internet does not demonstrate any thinking. Thinking would require at least establishing at first possible alternatives. So, let’s do that, let’s list the alternatives about the report. What alternatives exist in terms of a collusion between Russia and Trump’s campaign? 1. There was no collision. 2. There was a collusion but Mueller did not find it. 3. 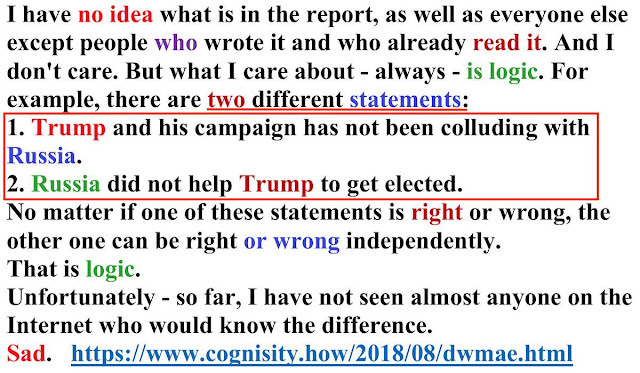 There was a collusion and Mueller did find it but did not include in the report. 4. There was a collusion, and Mueller found it and included in the report. II. Obstruction of justice by Trump. 1. There was no obstruction of justice. 2. There was obstruction of justice but Mueller did not find it. 3. There was obstruction of justice and Mueller did find it but did not include in the report. 4. 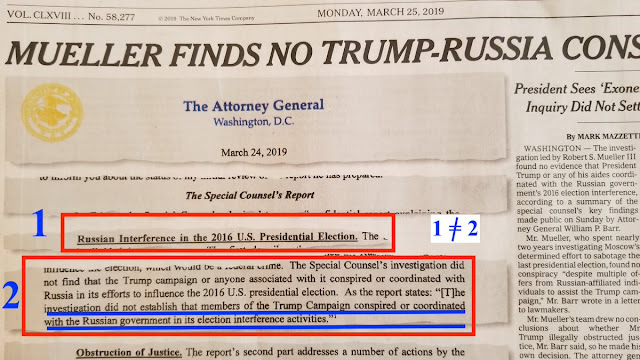 There was obstruction of justice, and Mueller found it and included in the report. III. Russian interference with elections that helped Trump. 1. There was no interference. 2. There was interference but Mueller did not find it. 3. There was interference and Mueller did find it but did not include in the report. 4. There was interference, and Mueller found it and included in the report. Thinking why would Mueller do this or that – would demonstrate some sort of analysis, but only if we had more information, and we don’t. We also have three alternatives regarding the summary issued by DOJ. 1. The summary was accurate and fully informative. 2. The summary was accurate but partially informative. 3. The summary was inaccurate. The only people who know what alternatives are correct are the people who wrote the full report, and the people who read the full report. I am not “those people”. No one on the internet, or TV, or radio is “those people”. Which means, whatever people think about the report is a speculation based on nothing but the desire to feel good/right. The Democrats can list all my alternatives and use the list as a means for pushing for the access to the full report. 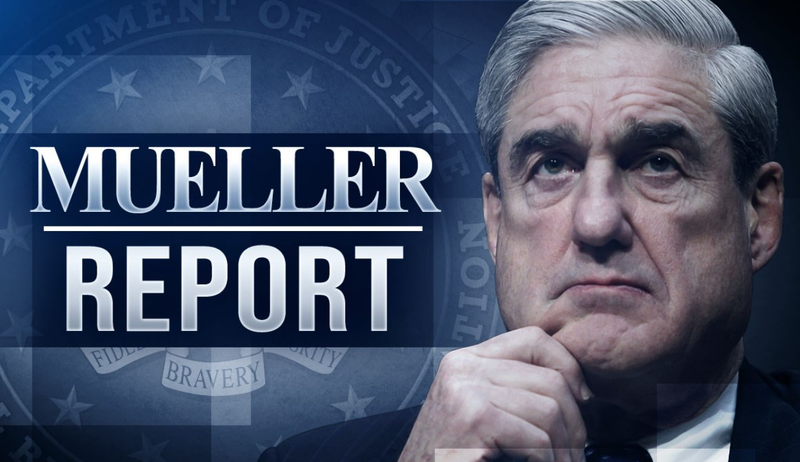 But until the full report will become available to more people, at least to the members of Congressional committees on foreign affairs, judicial committee, etc., the Mueller report does nothing. Right here, on the front page, we see why #Russia won in 2016. People who are supposed to be smart show no trivial logic. The Mueller investigation was into Russian meddling with elections. So, the question the report must answer is "Did Russia meddle?" But as a magician deflects the attention of audience by waving a red scarf in his right hand, at the same time using his left hand to shuffle things in his pockets, all media focus on flashy things. 2. Russia meddled a lot. 3. Russia meddled so much that without its meddling Trump would have almost no chance to get elected. But if this is what actually happened, would it mean that the result of the elections is illegitimate? But I would pretty much like to know. But no one wants to talk about this. Professional communication: a case study.